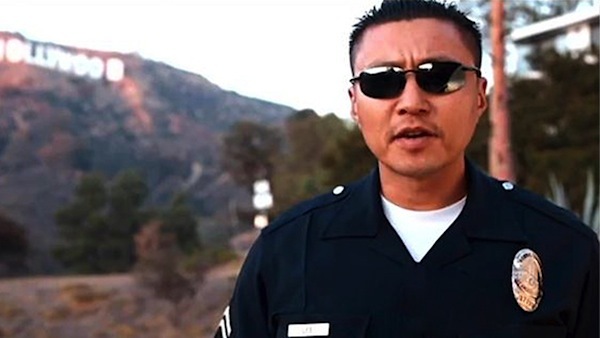 Police Officer Nicholas Lee was killed when his patrol car collided with a commercial vehicle at the intersection of Loma Vista Drive and Robert Lane, in the Beverly Hills area of Los Angeles. He and an officer he was training were responding to a call when the patrol car collided with the truck carrying a roll-off dumpster at approximately 8:00 am. The other officer and truck driver both suffered critical injuries. It was determined that the truck driver failed to properly maintain the vehicle's brakes, which caused him to be unable to stop. The driver was sentenced to five years probation in May 2018. Officer Lee had served with the Los Angeles Police Department for 16 years. He is survived by his wife and two daughters. It was night time when we were instructed to get closer to the memorial wall at the Biscailuz Academy so that we can observe a name to reflect on. From my vantage point, the first name I could make out due to the light fixture was yours. It was a surreal feeling since I knew immediately you were Korean American just like me. As someone who came from a Korean American background and is aspiring to become a peace officer like you, I truly want to thank you for your service and offer my sincerest condolences to you and your family. When times get tough I will remember you along with the numerous brothers and sisters you are memorialized with at Biscailuz Academy. Again, thank you for your service .